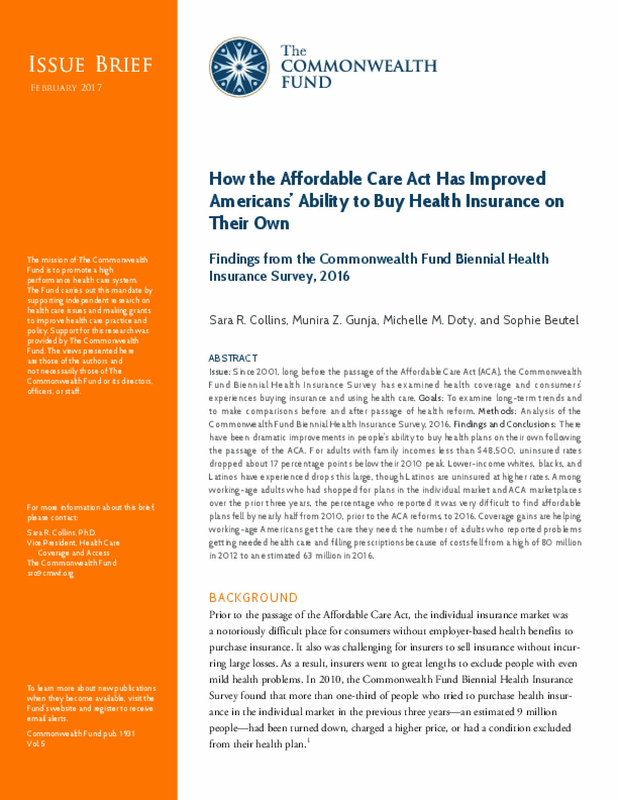 Issue: Since 2001, long before the passage of the Affordable Care Act (ACA), the Commonwealth Fund Biennial Health Insurance Survey has examined health coverage and consumers' experiences buying insurance and using health care. Goals: To examine long-term trends and to make comparisons before and after passage of health reform. Methods: Analysis of the Commonwealth Fund Biennial Health Insurance Survey, 2016. Findings and Conclusions: There have been dramatic improvements in people's ability to buy health plans on their own following the passage of the ACA. For adults with family incomes less than $48,500, uninsured rates dropped about 17 percentage points below their 2010 peak. Lower-income whites, blacks, and Latinos have experienced drops this large, though Latinos are uninsured at higher rates. Among working-age adults who had shopped for plans in the individual market and ACA marketplaces over the prior three years, the percentage who reported it was very difficult to find affordable plans fell by nearly half from 2010, prior to the ACA reforms, to 2016. Coverage gains are helping working-age Americans get the care they need: the number of adults who reported problems getting needed health care and filling prescriptions because of costs fell from a high of 80 million in 2012 to an estimated 63 million in 2016.